Some people like to enhance their daily meditation by reading scriptures. They find it inspirational, spiritual and it provides another concept for their mind to focus on thus removing ailments such as stress and anxiety. In the scriptures, meditation refers to careful, prayerful and deep thought. Reading the scriptures can naturally transcend into meditation upon individual verses as some of the text will raise questions or require further thought. Start by relaxing, breath deep and ask for the guidance of god in your devotion. Allow your mind to be open and seek wisdom ad well as understanding from the scriptures. Choose the scripture you wish to read. People frequently can not decide what scripture they want to read and get frustrated. 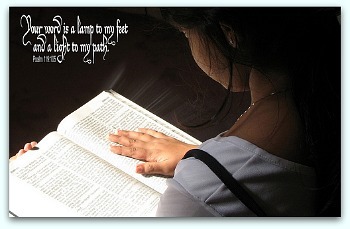 A simple approach is to start at the beginning of your bible and read a chapter every day. A second approach is to randomly open your bible to a page then read from there, this technique is called Ouija. How much of the scripture you want to read is entirely up to you. You can choose a partial verse or a whole bunch of verses. The advantage of meditating on shorter parts of the scripture is that you can memorize big amounts of the scripture rather quickly. The oldest scriptures are the Ancient Egyptian Pyramid Texts they are dated 2400-2300 BCE. The connection between text and meditating is evident. Boat of Ra also called Waa Sha and ocean awareness meditation. Waa means boat, this is a pun for meditation. Sha means Ocean of Awareness. The analogy used by the texts to describe the meditation technique is a boat crossing the water to get the other side is used in Buddhism. This is a video of the boat parable. 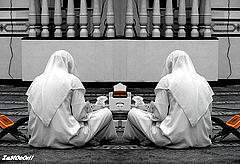 The Quran encourages Muslims to meditate on the Quran. The word taffakur means pondering. Taddabur basically means the same thing reflecting, pondering, thinking. 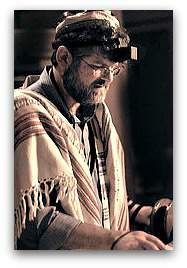 The Torah tells Jews to meditate on the Torah. See the earlier quote from Joshu 1.8. It is also says in Psalms 1:1-2. Happy is the man who does not go in the company of sinners, or take his place in the way of evil-doers, or in the seat of those who do not give honor to the Lord. Shown below are a some scripture readings, these are updated daily, simply click on the link to view the whole passage. If there is a daily updated scripture rss feed you would like me to add contact me and I will add it to the list. If you liked this page you may also enjoy Prayers for healing.